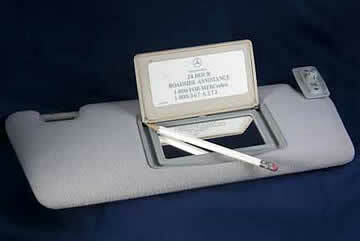 Visor flaps frequently undergo many operations and as a result tend to wear out the plastic pins that function as pivot hinges for the flap body. A close up of the original pin area of the visor flap shows the pin totally lost due to wear. To effect a repair this area should be trimmed back to create a flat face perpendicular to the flap body. A set of new stainless steel visor pins. After the face is reshaped a hole is drilled into the flap body using an ordinary pin vise and drill bit. 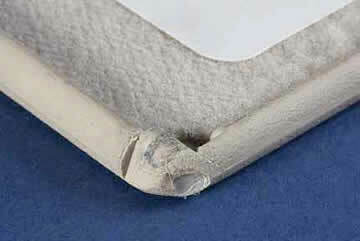 The flap material is soft and the hole can be created in minimal time with only manual tools. 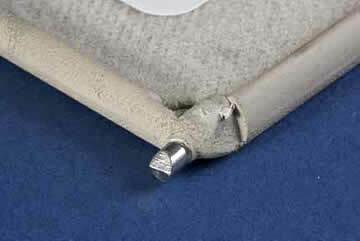 After the hole is completed the replacement pin is pressed into the hole to recreate the hinge pin function. Note the flats on the pin surface. 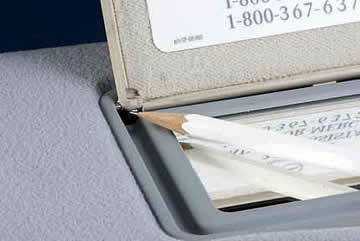 These mimic the original plastic pins and serve to lock the flap upright so it maintains it's position when opened. The completed repair. 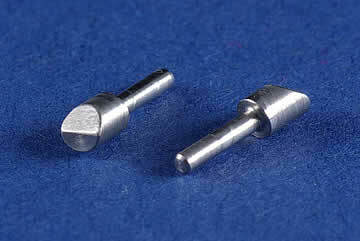 The pins are stainless steel and will not corrode or discolor in use over time.